Francis Bacon, no particular relation to Roger, is credited with introducing inductive reasoning into scientific inquiry in the 17th century. 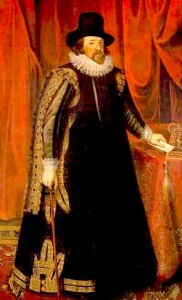 A distinguished member of the English aristocracy during the reigns of Elizabeth I and James I, his life was a checkered affair that included a destructive corruption scandal. However, as the 20th-century writer and anthropologist Loren Eiseley put it, Bacon, "more fully than any man of his time, entertained the idea of the universe as a problem to be solved...."
Bacon was a philosopher, and he sought to resolve the problems that Aristotle's deductive approach to creation presented, such as the fact that Aristotle decreed that the world conformed to his construction of it, rather than vice versa. Not only that, but most medieval thinkers had swallowed Aristotle whole, and regurgitated his ideas, which were often not even close to being correct. Bacon was frustrated by the obsolete and often clearly erroneous view of the world most of his contemporaries held. He sought to bring a whole new approach to philosophy and science. And so he did. While many others built on his ideas, Bacon accomplished something truly revolutionary. Inductive reasoning begins with specific details and observations — of natural occurrences or behavior, say — and uses them to arrive at a principle to explain them. What we now call the scientific method is largely inductive. Deductive reasoning moves from the general to the specific. It uses logic to confirm something we already know to be true. Deduction is vulnerable to error at every step because it accepts the truth of the elements it uses to establish new truths. This entry was posted in History, People, Science and tagged Aristotle, deductive reasoning, Elizabeth I, Francis Bacon, inductive reasoning, James I, Loren Eiseley, scientific inquiry, the scientific method by Delia. Bookmark the permalink.